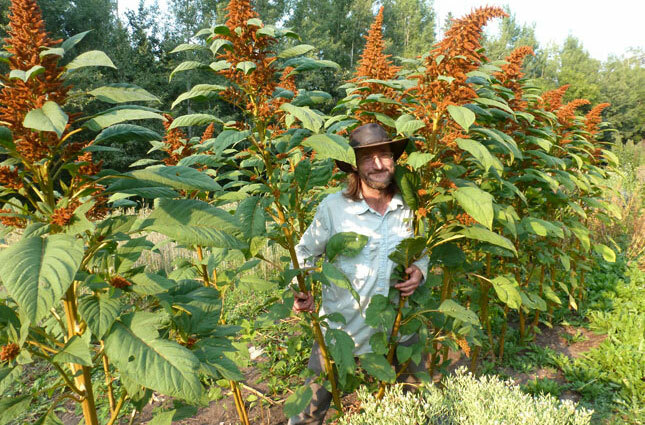 Golden Giant is a majestic amaranth that can grow to more than 2 m (7 ft) tall. It has green leaves, with a coppery brown seed head. We are experimenting with this variety for seed production, and find that yield depends on early planting and the timing of the first -7 C frost. Leaves are edible, but not as tender as Burgundy Amaranth. Sow seed in early May, 6 mm (1/4 in) deep in full sun, with germination in 1 - 3 weeks. Thin to 45 - 60 cm (18 - 24 in) apart in rows 76 cm (30 in) apart. Flowers midsummer, with the first seed ready early September. Let it mature until killed by the first hard frost, unless you have a long season and the birds are eating it. Cut the tops off and dry in a sheltered rodent proof area, then rub through a screen or thresh with a bucket thresher to remove the seeds. Screen and winnow to clean the seeds, which can be cooked - with or without toasting - or ground into flour. Will cross pollinate with Redroot Pigweed.